It’s always wonderful to discover another craftsman of international quality working in England. David Jackson makes artists brushes, each one individually, by hand, and perfect. 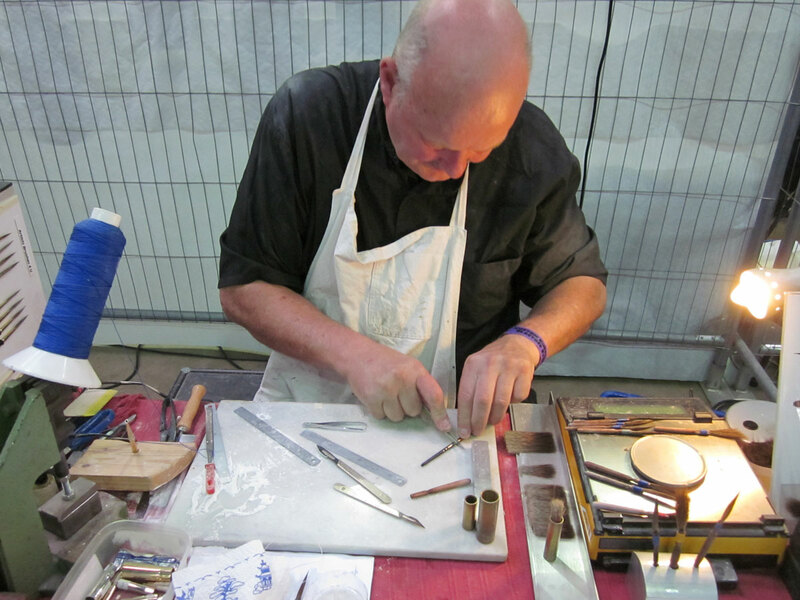 In fact, David grew up in the trade, and is the 4th generation hand-making fine brushes for fine artists. A few years ago a striper presented David Jackson with a pinstriping brush, and asked if he could make one. As anyone acquainted with him will know, Dave just loves a challenge, and this was definitely something a bit different for him to try his hand at. He spent a week or so in deconstructing and analysing, then he made his first thread ferrule dagger striping brush. Then he did it again and again and again until it was exactly as he felt it should be. Then he got it tested out by the striper who showed him the original brush, and used the feedback to redesign and fine tune his design. Then he did it all over again and again and again (If you haven’t already guessed, David is a master craftsman and an absolute perfectionist, and each brush that he produces has to be exactly right!). Everyone who attended KKBO show this year, or indeed last year, would have no trouble whatsoever in identifying Dave. His work table, with its amazing display of brushes, set at one side of the paneljam, had a constant group of awed stripers and letterheads watching while Big Dave chatted and made striping brushes, often to order, with the ease of you or I making a cup of tea! After watching as Dave made me a brush at KKBO, I asked him if he could show me how to do it, as I really fancied having a go myself. He looked at me and laughed, and told me if I was working for him full-time he would allow me to handle the (very expensive) materials he uses to make these brushes after around two years of training, and after that it would take me just a few more years of practice to develop the skills I would need to produce a decent brush! 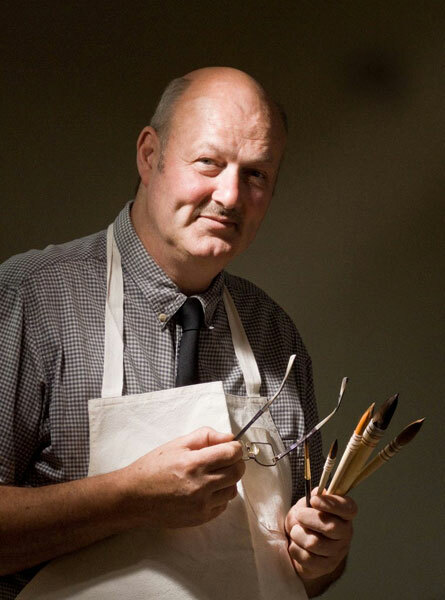 As well as his original ranges of brushes for fine artists, David Jackson now produces a wide variety of specialist brushes for stripers, sign writers and other decorative artists. Alongside the usual sword daggers, scrollers and lettering brushes, he makes brushes of several styles that he is repeatedly asked for by his customers: striping brushes with big, solid, chunky handles that don’t get lost in the hands of big men, tiny brushes for model makers, and brushes with double-size belly’s that hold twice as much paint as usual for pulling very long, even stripes, and many others …… His speciality, however, remains listening to his customers’ problems, then individually designing and creating for them a brush that will meet their needs and enable them to produce the result they wish to achieve. Dave Jackson has now made several brushes for me. When I (reluctantly) showed him my poor butchered Mack’s, he designed and made me a custom brush set that have needed no further modifications, and they are fabulous! Did I mention that man likes a challenge?